When did BBC2 begin broadcasting? And what was the first feature film that it showed? The easily-Googlable answer to the former is of course Monday 20 April 1964 – although famously the opening night did not exactly go according to plan, and after a technical breakdown the service was relaunched the following evening. 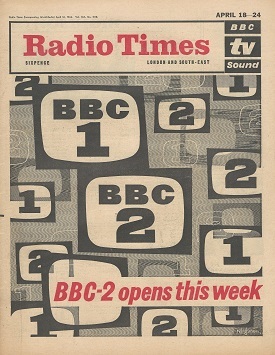 A bit of additional research will reveal that the first film officially broadcast on BBC2 was Charlie Chaplin’s The Gold Rush (1925), previously shown on Christmas Day 1963 by BBC1 – or, as it was known at the time, BBC Television – to a record audience and repeated in the new channel’s revival slot Encore on 22 April. However, these are not the only possible answers to the questions.